OVER 90,000 children under five in Eastern Highlands will be given oral vaccination against polio over the next two weeks, according to WHO (World Health Organisation). WHO team coordinator outbreaks and health emergencies Dr Zhang Zaixing said this to a crowd in Goroka on Monday during the launching of the fight against polio outbreak in the Eastern Highlands. 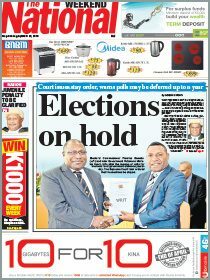 “Over the next two weeks, up until October, we are targeting to cover three provinces (Morobe, Madang and Eastern Highlands) that have polio outbreak,” he said. Zaixing called for support from everyone in the province. “Starting today and over the next two weeks, we are conducting a wide vaccination programme for all children under five years to protect them from polio,” he said. He said the campaign was for the first rounds of vaccinations, with more to follow over the next three months. “I make a personal appeal to all parents and carers to bring your children under five for polio vaccination,” Zaixing said. United Nations Children’s Fund’s communication for development specialist Fredrick Musoke said the campaign was to get all children vaccinated. He said Unicef believed in empowering future generations and would continue to support the fight against polio.